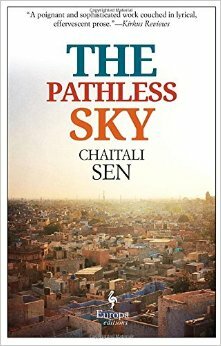 My novel, The Pathless Sky (Europa Editions, 2016), is about a couple whose relationship is weighed down by the history and politics of the (fictional) country in which they live. I worked on the novel from 2009 to 2015, and while there wasn’t any particular world event that informed my imagination, all of the news during that period, including the civil war in Syria, the global refugee crisis, and even climate change, provided some of the context for the choices I made in the novel. In my fictional country, as in all countries, history — or more accurately the conflicts left unresolved in history — has a way of spiraling back. Although the country in The Pathless Sky is unnamed and imaginary, I never meant it to be an allegory about some distant or hypothetical tyranny across the world. If I had envisioned a different set of characters, I could have easily set my novel in the U.S. or India or England, any country I knew better than the one I had to make up from scratch. I didn’t want to be bound by any real borders, even the ones in my mind, so I didn’t set the story in a real place, but not because the things that happen in my imaginary country can’t or don’t happen here. In some ways, my novel is an intimate exploration of a controversial Marxist assertion that all governments are a dictatorship of one class or another. I remember this conception of democracy-as-dictatorship causing a stir in my first political science class in college, and in the twenty years since then, I can’t help but notice how this assertion gets tested in real life. As just one example, look at all the things Black men don’t get to do in this country without serious risk to their lives at the hands of police or violent enforcers of white supremacy. With policies like Stop and Frisk, which gave the NYPD license to stop and search any civilian based on “reasonable suspicion” and was applied almost exclusively to the city’s Black and Latino population, it becomes evident that certain people, even in a modern democratic republic, live like they’re under occupation, with restricted mobility and rights and the constant threat of execution or imprisonment. This is the central conflict in my novel. What happens when members of two different classes, one enjoying all the privileges of the state and one that is denied those privileges, try to build a life together? How do they escape the clutches of history? If all of this sounds abstract, in some ways it was. I didn’t have a true sense of what it must feel like to have so little control over one’s own life. I could only imagine that. I had never directly experienced any real societal upheaval. That, also, I could only imagine. I didn’t really have a sense of how quickly things can change, how unexpected crises can erupt and cause everyone in the society to have to make moral choices they never expected to make, to decide whether to adjust, accommodate, or refuse to cooperate. If I were writing this book today, maybe I would not have chosen a fictional country at all. Maybe the actions of the government would have been even more extreme, absurd, and dangerous. Maybe my couple, divided not only by their disparate freedoms but by their different responses to tyranny, would have found their relationship to be untenable. Some recent readers have told me that The Pathless Sky captures how they are feeling now, with all the conflict, uncertainty, and danger the Trump presidency has imposed. As writers, we don’t always know if our work will be relevant over time. I’m glad that my novel has helped some people feel less alone and untethered in these times, but I hope that one day, the political landscape it paints will be confined only to the imagination. Chaitali Sen is a writer and educator based in Austin, Texas. Her debut novel, The Pathless Sky, was published by Europa Editions in 2016. [Read my review.] Her short stories, reviews, and essays have appeared, or are forthcoming, in Brooklyn Magazine, Catapult, Chicago Quarterly Review, Colorado Review, Ecotone, LitHub, Los Angeles Review of Books, New England Review, New Ohio Review, and many other publications. She is a graduate of the Hunter College MFA program in Fiction and founder of the interview series, Borderless: Conversations in Art, Action, and Justice. She is at work on her second novel.